Skyscrapers Architects Albert C. Martin, Sr.
Bank of America Plaza (formerly known as the Security Pacific Plaza) is a 55 story high-rise located in Los Angeles, California in the United States. It was completed in 1974 with the headquarters of Security Pacific National Bank, and Sheppard, Mullin, Richter & Hampton as its main tenants. The 55-story building has a structural height of 735 feet (224 m) and is the 5th tallest building in Los Angeles, and the 83rd-tallest building in the United States. Citigroup Center (formerly 444 Flower Building) is a 625 ft (191 m) 48 storey skyscraper at 444 S. Flower Street in the Bunker Hill area of downtown Los Angeles, California. When completed in 1979, the tower was the fifth-tallest in the city—as of 2009, it is the eleventh. The building was previously owned by Beacon Capital Partners which purchased the property in 2003 for US$170 million, and later to Broadway Partners Fund Manager, LLC from December 2006 to September 2009. 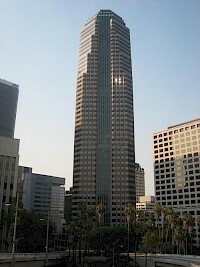 Figueroa at Wilshire (originally known as Sanwa Bank Plaza) is a 717 ft (219m) tall skyscraper in Los Angeles, California. It was constructed from 1988 to 1990 and has 53 floors. 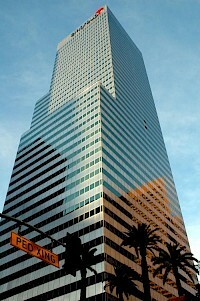 It is 8th tallest building in Los Angeles, 96th-tallest building in the United States. It was designed by Albert C. Martin & Associates, and developed by Hines Interests Limited Partnership. It won the Rose Award for "Outstanding New Office Building" in 1991. The Higgins Building is a proto-Modernist building located in downtown Los Angeles, California. Built and owned by Thomas Higgins, an Irish American in 1909, the building was originally used for office space and years later was transformed into downtown lofts. The architects were Albert C. Martin, Sr. and A.L. Haley. The Higgins Building also houses one of Los Angeles' premier nightclubs in its basement, The Edison, which opened in 2007. 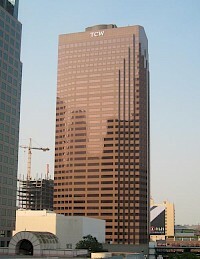 The TCW Tower is a 517ft (158m) tall skyscraper in Los Angeles, California. It was completed in 1990 and has 39 floors. It is 19th tallest building in Los Angeles, and was designed by Albert C. Martin & Associates.In 1990 it was awarded the 'Outstanding Structural Design Award' by the Los Angeles Tall Building Structural Design Council. 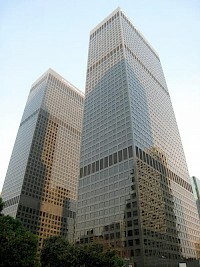 The building is headquarters to the Trust Company of the West, an investment firm. 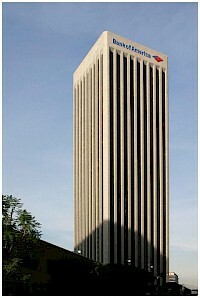 The Union Bank Plaza is a 516ft (148m) tall skyscraper in Los Angeles, California. 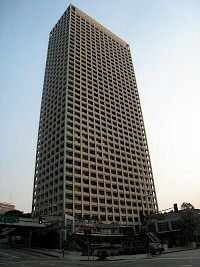 It was constructed from 1965 to 1968 and has 40 floors. It is 20th tallest building in Los Angeles. 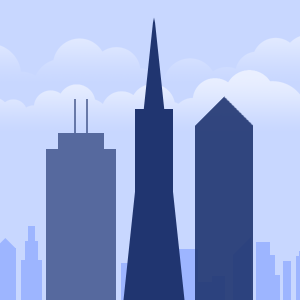 It was the first skyscraper to be built as part of the Bunker Hill Redevelopment Project.